For three consecutive years SafeDNS successfully passes a rigorous test by AV-Comparatives, a globally known and respected independent test lab to confirm an excellent quality of the SafeDNS web content filtering service for parental control and internet security. 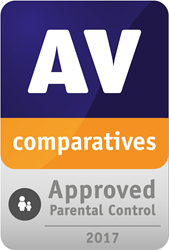 This years' test and review proves SafeDNS is the best among the 3 parental control solutions tested and SafeDNS once again gets Approved Parental Control Product award by AV-Comparatives. The award-winning SafeDNS service is a great tool for families to filter the internet preventing kids from surfing to dangerous and unwanted resources. The test shows SafeDNS perfectly filters adult content – 99,8% of it. The figure surpasses that of other parental controls tested this year. 79% of weapons-related resources which is whopping 4,4x better than in 2016. What makes it even better, for the third year straight SafeDNS has had no false positives during the test. It means child-friendly content is always available to SafeDNS users, without a hitch. The filtering quality of the entire service has been enhanced due to drastic improvements to the core of everything SafeDNS does – its own database of internet resources classified into 57 content categories. Since last year the database's grown about 8x – from 11M to over 90M resources. It powers all SafeDNS solutions and provides a high-precision filtering on all the mentioned categories and 5 dozen more of them, including categories most relevant to web users' safety online (like botnets, virus propagation, phishing etc.). A comprehensive range of SafeDNS products and services for web filtering and cyber security includes solutions for internet and mobile service operators. Over 300 of them already use the company's products in Americas and the EMEA. With SafeDNS these telecoms can make the internet cleaner and safer for up to 13,5M of their subscribers. The SafeDNS solutions are also getting popular with network equipment manufacturers as the company provides them an integration-ready filtering technology. Zyxel (Taiwan) and Fältcom (Sweden) are early adopters of the SafeDNS solutions. In the EMEA these manufacturers successfully sell SafeDNS enhanced routers increasing end users' web security and getting more revenue. The company has recently secured another technological partnership – with Dovado, a Swedish router supplier. In a word the Approved Parental Control Product award validates what the company's users already know well – SafeDNS allows them to protect kids and adults against inappropriate online content, web ads, botnets, phishing and malware sites. This is the exact reason SafeDNS partners choose the company's technology to add value to their products. Pricing & Availability: You can access the SafeDNS database of categorized internet resources as a paid service. To learn more about accessing the database, pricing and other information, please contact SafeDNS at sales(at)safedns(dot)com or call +1-800-820-2530, +1-571-421-2990 (outside US). About Company: SafeDNS is an Alexandria, VA, US based company, worldwide provider of cloud-based web filtering and internet security solutions as well as threat intelligence services. In 2013 the company launched a commercial version of its web filtering service for home, educational and corporate users. In 2014 SafeDNS released its web filtering platform for ISPs and mobile operators. The SafeDNS filtering servers are located throughout data centers in Europe, New Zealand, North and Central America. Every day the company processes about a billion queries from users of its filtering service. Now the SafeDNS products and cloud service are used by more than 300 telcos, 4000 organizations and tens of thousands of home users and about one million of anonymous free users worldwide. The top quality of the SafeDNS web filtering service has already been acknowledged by world leading test labs and publications. In February 2016 SafeDNS became Editor’s Choice for Content Management & Filtering Solutions in 2016 Cyber Defense Magazine Infosec Awards. This January PC Magazine included SafeDNS into a list of the best parental control software for 2017. This August as well as for 2 previous years the service was named Approved Parental Control Product by AV-Comparatives. Learn more about us at safedns.com.